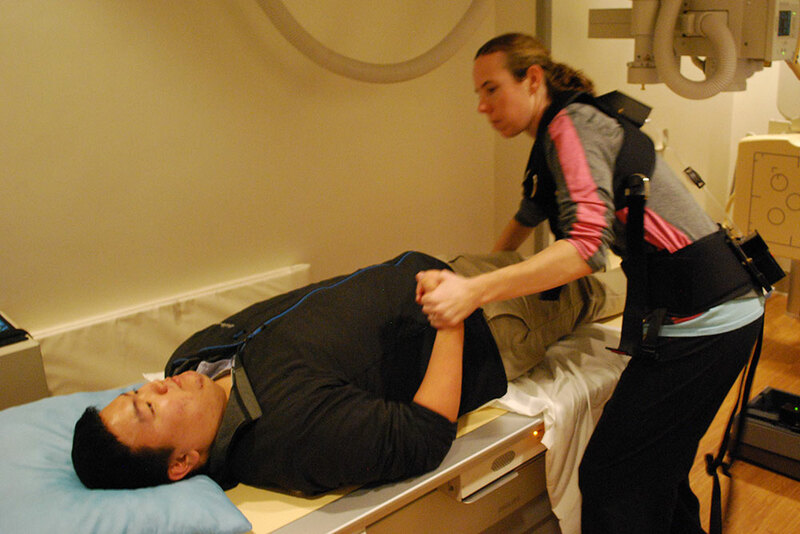 A Veterans Affairs Hospital radiology technician (right) helps biological systems engineering student Yuki Naoe up from an X-ray table as Naoe team was doing research for its senior design capstone project at a VA hospital in Omaha, Nebraska. A team of biological systems engineering students -- (from left) Yuki Naoe, Doug Rowen, Merrill Brady and Kristina Zvolanek -- go over their design of the Pivot Panel, which would help VA hospital radiology technicians more safely assist patients off an X-ray table. A computer rendering of the Pivot Panel, a device designed by biological systems engineering students that would help VA patients off an X-ray table. 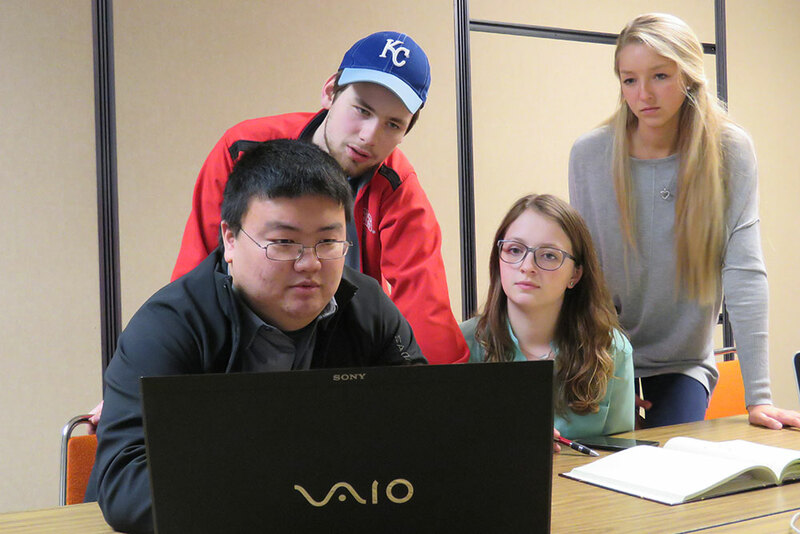 Helping the Veterans Affairs (VA) Nebraska-Western Iowa Health Care System in Omaha find a better way to assist patients off of an X-ray table was a challenge for a team of biological systems engineering students. In a narrow room that is barely big enough to house the X-ray table, radiology technicians must pull patients from fully reclined to a sitting position and then help them rotate 90 degrees to dangle their legs off the side of the table. "They have repurposed a small room and put this bulky equipment in there," said Kristina Zvolanek. "There's no room for a ceiling lift, like in other X-ray rooms, and it's too narrow to have a standard floor lift." The lack of suitable equipment for helping patients in this particular room was something the VA needed help in addressing. Considering the constraints – the size of the room and a lack of a budget for the project – the team of Zvolanek, Merrill Brady, Yuki Naoe and Doug Rowen began brainstorming ideas and designing devices. Those included inflatable and motorized lifting devices, handlebars that patients could use to pull themselves up and even one device that would slide the patient to one end of the table. After beginning the research into the problem, the team soon realized the project had another significant issue to consider – injuries to the radiology technicians who physically assist the patients off the table. "That was causing them to have back and shoulder injuries as they help the patients sit up and then pivot to get off the table," Zvolanek said. "We did ergonomic analysis on the problem to figure out how much at risk the technicians are and found that they are putting significant stress on their muscles and joints." This led to many ideas and device iterations – "something like 10," Brady said – before the team finally settled on a design in early March. It also helped the students form bonds. "Last semester, we all had different ideas of where we wanted this to go," Rowen said. "The part of getting together and figuring out why all the ideas we had in our head wouldn't work so well was important. It helped us come together as a team. Considering the project began in early September and had to be completed by the end of April, team members said they weren't feeling pressure to complete their design. "All last semester, all winter break, a couple months of this semester was working iterations of our ideas and figuring out which one would be best." Naoe said. "In the past month, we've made this design and included motor work and material work. All that wasn't difficult, it was just figuring out." "We do get a lot done in the time we are together," Brady said. "Kristina is the communicator. Doug is technology, Yuki is mechanics, and I've got a lot of abstract ideas. When we bring them all together, it goes really quickly." The team used computer software to design Pivot Panel to solve the problem. The device would be attached to the table. A patient would roll on to his right side and grasp a handle with his right hand. 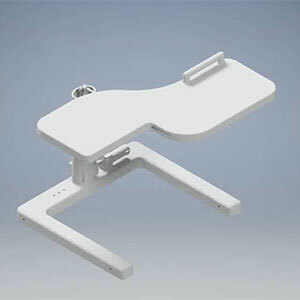 The panel then lifts the patient into a sitting position and rotates him to the edge of the table. As the project nears completion, Zvolanek said it's possible to reflect on the process and realize that real-world engineering lessons were learned. "We experienced so much as a team," Zvolanek said. This is so abstract for us because we don't have prototypes to test. We just have to use our best guess as to whether it would work." "And also, sometimes what your client tells you is the problem may not really be the problem. At first we had to get the patient from laying down to sitting up. But that's not the only issue. We had to consider the health of the technicians. Those surprises are things we're going to face in our careers after graduation."